Figure 5. 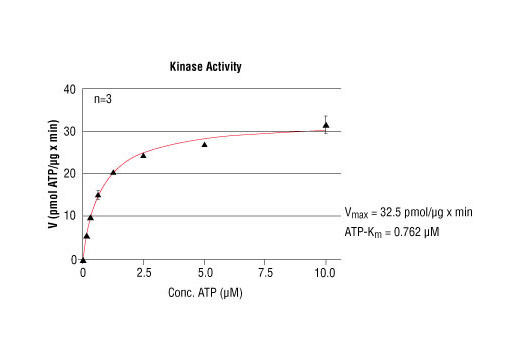 ABL1 kinase activity was measured in a radioisotopic filtration assay using the following reaction conditions: 60 mM HEPES-NaOH, pH 7.5, 3 mM MgCl2, 3 mM MnCl2, 3 uM Na-orthovanadate, 1.2 mM DTT, ATP (variable), 2.5 ug / 50 ul PEG20.000, Substrate: PolyAEKY, 5 ug / 50 ul, Recombinant ABL1: 5 Units / 50 µl. Figure 6. 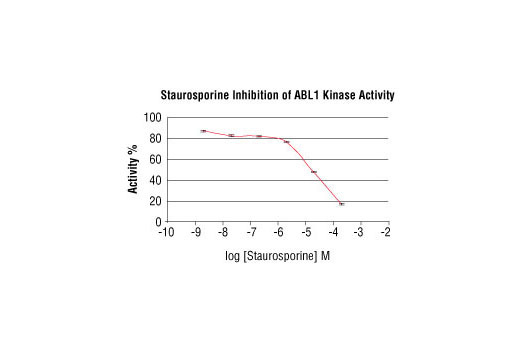 Staurosporine inhibition of ABL1 kinase activity: DELFIA® data generated using Phospho-Tyrosine Monoclonal Antibody P-Tyr-100 #9411 to detect phosphorylation of ABL1 substrate peptide (C03-719) by GST-ABL1 kinase. In a 50 ul reaction, 10 Units GST-ABL1 , 1.5 uM substrate peptide, 5 uM ATP and increasing amount of staurosporine were used per reaction well at 25ºC for 30 minutes. (DELFIA® is a registered trademark of PerkinElmer, Inc.). Figure 2. 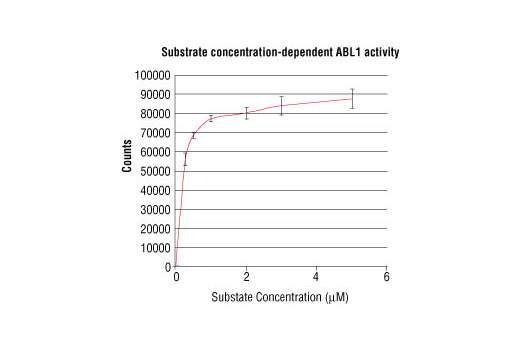 Treatment of Tyrosine Kinase Substrate Screning Kit #7450 with GST-ABL1 Kinase. Positive control is in yellow and negative control is in blue. 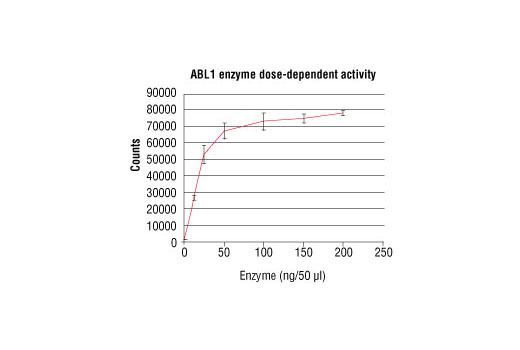 Several positive hits for ABL1 were identified using this approach (in red). 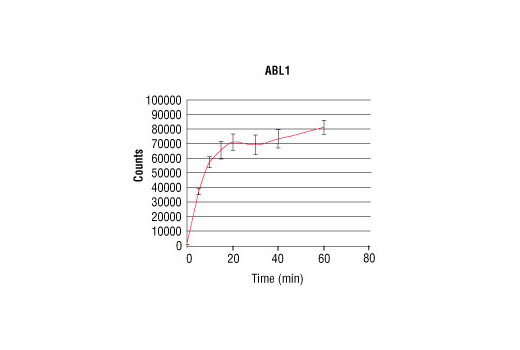 The star indicates the peptide chosen for this HTScan® ABL1 Kinase Assay Kit. 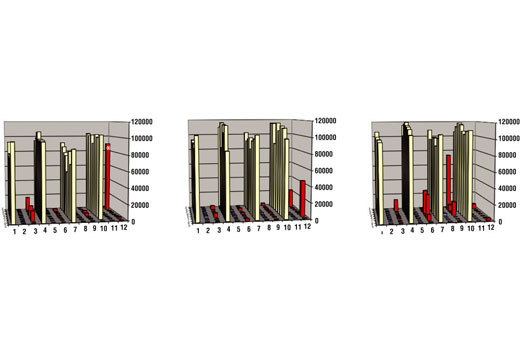 The kit provides a means of performing enzymatic assays with active human ABL1 kinase. It includes active ABL1 kinase (supplied as a GST fusion protein), a biotinylated substrate peptide and a phospho-tyorsine monoclonal antibody for detection of the phosphorylated form of the substrate peptide.